The area encompassing the Baltimore County park called Lake Roland was part of an 18th century land grant from Lord Baltimore to several Maryland families. The reservoir that is now the centerpiece of the park was formed much later in the 1850’s as a water source for the City of Baltimore and is also called Lake Roland. 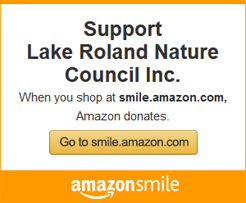 In the 1940’s the land surrounding the lake was consolidated by Baltimore City to form Robert E. Lee Memorial Park, with its 450 acres of woodland, wetlands, serpentine barrens, rare plants and rocky plateaus. In 1992, most of the park was declared a National Historic District — the Lake Roland Historic District — in recognition of its many historic elements, including the Greek Revival pump house, the dam and structures from the Susquehanna & Baltimore Railroad (later, the Northern Central Railroad). Looking north from the western bluff of “dogwalkers’ peninsula” in the Park toward the main body of Lake Roland. 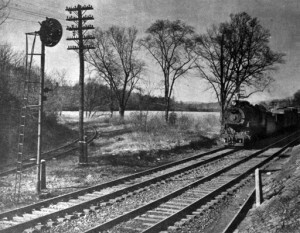 Photo courtesy Baltimore County Public Library. The former Northern Central Railway (NCR) line in the foreground is now used by the Baltimore area Light Rail system (having been relaid). The line to the left is the Greenspring branch of the NCR, which was also used by the Western Maryland Rail Road (WMRR) to connect trains to its station at Owings Mills. This branch trackage, despite falling into disuse decades ago, is still extant, if overgrown, running from near this vantage point about a mile around the western shore of the lake before petering out. Of the station building shown here, there is now barely a trace. The Relay House, or Hollins Station, at Lake Roland is pictured in a Sun rotogravure section reprinted in the 1950s. Lake Roland is at back with bridge at right. 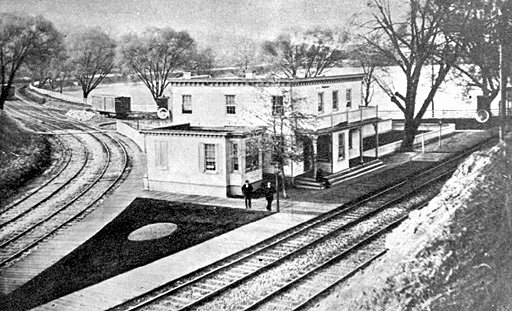 The station, which served the Greenspring branch of the Northern Central Railway, was closed in 1926 and destroyed by fire in 1933.